Restaurants catered for the middle and working classes in the 19th century. They provided nutritious but cheap food like fish or stew that was cooked quickly and easily. 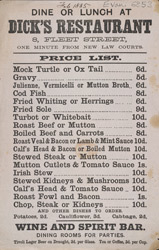 One of the dishes featured on the menu of this restaurant is mock turtle soup. This dish was a speciality in Greenwich and Blackwall during the 1880s and 90s and was very popular. It was a very expensive dish and few could afford to eat it. Mock turtle soup was an attempted reproduction of the dish on a much cheaper scale and was actually made from a calf’s head.